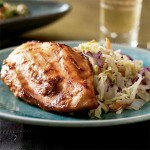 Healthy Recipe to help you get the most flavor and nutritional bang out of your chicken dishes. A simple and easy to do pizza with your favourite choice of tandoori Chicken. The pizza is perfectly moist and flavorful with a sauce close to masala instead of a traditional pizza sauce. Skip the regular pasta sauce and have a different and delicious new pasta meal! Try this easy pasta with lemon and garlic, it is oh so tasty! Chicken dish infused with carom seeds. Melt in mouth Cheese chicken kababs serve as a great starter. Boneless Chunks of Chicken cooked with ginger/garlic and tomatoes garnished with green peas. Very tasty rolls which are great for a supper or for childrens lunches. Once tried you will be hooked. Eat these spicy wings hot or cold. They also make a great appetizer. Easy to make hard to resist. Chicken pieces prepared in soya sauce, chilies and spices. Chicken breast brushed with Lemon juice and other seasonings and baked in oven is packed with flavors and comes in healthy eating. Chicken Jalferazi cooked in yogurt and tomato. This tastes good along with Naan or Chapathi. Bread slices coated in shredded chicken mixture and shallowfried. Minced meat marinated in a spiced yogurt marinade and then shallow fried. 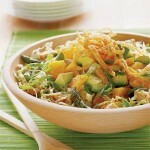 Serve with chatni, lemon wedges and naan bread. Marinated Chicken cubes skewered with hearty blend of vegetables.